Machine Gun Surface replaces missing faces and surfaces until the CAD model is watertight. The sequence is simple; just click the Machine Gun Surface button (found on the MagicHeal toolbar). 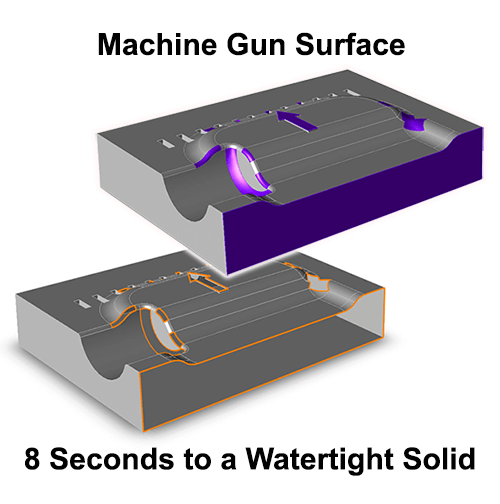 In the example in the image at right, Machine Gun Surface replaced thirteen surfaces in less than 10 seconds. The last step, if you are satisfied that the model looks good, is to select all the geometry and run Lite Repair (from the Home toolbar) to stitch the newly added surfaces to the model. Machine Gun Surface is an automatic version of the Find Next & Cover feature found in Advanced Repair, part of the MagicHeal add-on. The benefit of Machine Gun Surface is that, once you hit the button, it will cycle through all openings in a model until it is done, meaning that dozens or even hundreds of surfaces can be added in just a few minutes, with no additional user interaction. New Surfaces are Based on Open Circuits: Machine Gun Surface replaces missing surfaces by detecting existing surrounding geometry, otherwise known as ‘circuits’; the new surfaces are purple so it is clear that they are derived. This is important because if two or more neighboring surfaces are missing, Magic Surface has no way to calculate the ‘edge’ that was between them, thus that information is lost. Underlying Repair Issues Must Be Addressed: Sometimes Magic Surface is unable to apply a surface to an open circuit because there are underlying issues, such as self-intersections or duplicate vertices. To address more serious issues with geometry, select the surfaces in question and run Full Repair. Then try Magic Surface again. Newly Created Surfaces can be Deleted: If for any reason you are not satisfied with a newly applied surface, simply select it with the Single Select tool and delete it by pressing the Delete key on your keyboard. The next time you run into a model that’s missing surfaces, consider using Machine Gun Surface to quickly generate new surfaces. In the example shown in the image above, all thirteen missing surfaces were generated within 8 seconds.